Authority and control has historically opposed compassion and freedom. To attack despair in the most vulnerable peoples demands great courage. 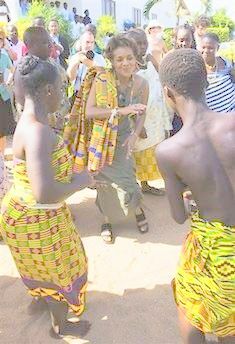 To call others to life: to live a still-difficult life, to not allow your heart to harden, is a message of compassion, kindness and solidarity worthy of any world leader. 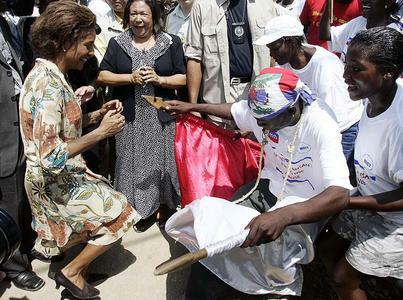 Governor General Michaëlle Jean dances in her childhood town of Jacmel during a visit to Haiti in 2006. Maybe not everyone may be able to create this transcendence. But if a Haitian refugee and a farmer’s son can do it, maybe there’s hope for us all. You’re dressed to kill and guess who’s dying? This entry was posted on Tuesday, October 19th, 2010 at 5:00 am and is filed under Despair. You can follow any responses to this entry through the RSS 2.0 feed. You can leave a response, or trackback from your own site.